Tonight, the student of George Brown College, Institute without Boundaries program presented their exhibit for the TO DO festival entitled: Reflections: Unwritten Histories of Toronto’s Waterfront. Last week I was part of an Institute without Boundaries charrette, Airport City, that examined how Toronto Pearson International Airport can better integrate into its surrounding neighbourhood and the region in the context of future growth, in relation to community, government and corporate stakeholder needs. As you may or may not know, Toronto Pearson International Airport has an ambitious goal to become North America’s premier gateway to the globe. It is already one of the fastest growing connection airports in North America and is the continent’s second largest international airport to New York’s JFK. Today, the Airport serves 36 million passengers and by 2030, is expected to double the number of passengers it serves. How can we define the Airport’s role as a gateway to the Region? Why bring everyone to the airport when you can bring the airport to everyone? Distribute the airport. Connexus – Connects us is a multi-nodal centre that weaves communities, commerce and environments together thorough a holistic experience creating a cultural nexus of the world. Through this approach it reduces time, allows for expansion and builds up sub-centres to bridge the region to the world. How can the Airport manage two levels of growth: increased traffic at the Airport itself and increased population and activity within the Greater Golden Horseshoe? The airport expansion is not yet limited by space. The airport requires community buy-in to expand its capacity. Bring the diversity of the community to the airport and the benefits of the airport to the community. Through this approach it facilitates vitality through the balance of airport growth and community benefits. How can the Airport build productive relationships with local municipalities and industries? An ecology of shared priorities co-created between the Airport Community, the employees, neighbour and stakeholders. How can the Airport be repositioned as the ultimate mobility hub, a centralized connection point for municipalities in the Greater Golden Horseshoe? A mixed-use strategy for the surrounding lands at the Airport to serve as a catalyst for multiple scales of connectivity. How can the Airport’s role be leveraged to facilitate further economic development? 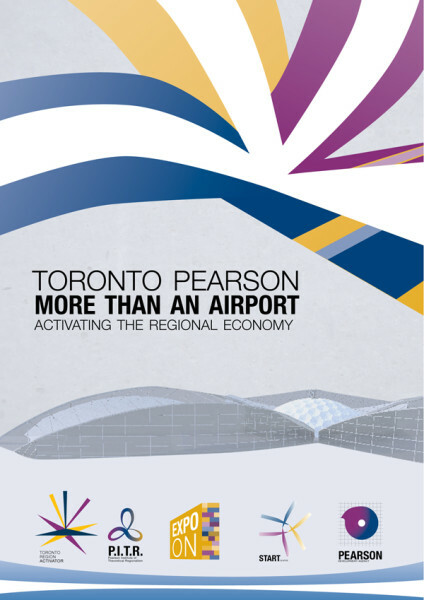 Toronto Pearson International Airport will be a regional gateway to the world through initiatives that aim to drive the economy through redevelopment of the airport district to create a progressive economic zone, as well as establishing a network of partnerships that will position Pearson as a leader in regional thinking. To know what happens next, well you will have to stay tuned. The next level of synthesis of these projects will be presented later this year in a full report which the Institute without Boundaries will release to the public. If you have any comments or questions regarding the proposals, please do not hesitate to engage in the conversation with us. Change agents is a collection of people and ideas that have pushed the Imaginando Lota project. Inspired by our People Change Places vision, this video aims to express the challenges facing the urban city and how collective action can make lasting change in a community. This is how we changed a place and how ultimately how a place changed us. Lota is mysterious and friendly, timeless and vibrant, tragic and hopeful. There is enormous potential in Lota to both enhance existing assets and build on opportunities to create a resilient city. The team has prepared a revitalization plan to help catalyze this potential. Over the course of these eight months, the team came to love Lota and its people and is humbled to have had the opportunity to help shape its future. After just 4 days, the designs were thorough, imaginative and practical. A panel made up of representatives from each of the 3 international schools as well as the IWB / George Brown College evaluated all the final designs in a day-long presentation session. The top three designs were awarded badges of recognition and the judges had positive comments on each of the projects that were presented.